This online course has been designed to instruct learners in the performance of "limited obstetric ultrasound". The American Institute of Ultrasound in Medicine (AIUM) defines a "limited ultrasound" as one which is "performed when a specific question requires investigation" (see "AIUM Practice Guidelines for the Performance of an Antepartum Obstetric Ultrasound Examination" — www.aium.org). This course is an outgrowth of the need seen for a limited obstetric ultrasound course to train medical personnel in the performance of limited obstetric ultrasound. The course follows an over 10-year history of instruction in limited ultrasound courses and now uses web-based technology to enhance the availability of such training. It follows the models for adult learning with the use of multiple modalities and repetition to achieve learning. The course is original in its content and organization. It follows the guidance of both the American Institute of Ultrasound in Medicine (AIUM) and the American College of Obstetricians and Gynecologists (ACOG) for training individuals in limited obstetric ultrasound. Dr. Byron C. Calhoun, MD, FACOG, FACS, MBA is a diplomate board certified by the American Board of Obstetricians and Gynecologists in general Obstetrics and Gynecology and in the sub-specialty of Maternal-Fetal Medicine (high-risk obstetrics. He has over 20 years of ultrasound experience including complex prenatal diagnosis and ultrasound education of medical students, nurses, residents, and fellows. Dr. Calhoun has authored over 60 scientific peer review articles in the Obstetrics and Gynecologic literature, presented over 100 scientific papers, and participated in over 40 research projects. Dr. Calhoun presently serves as Professor and Vice Chair in the Department of Obstetrics and Gynecology at the West Virginia University-Charleston and is involved in resident, medical student, and sonographer education. He is licensed in several states and continues in active practice in maternal-fetal medicine, performs diagnostic ultrasounds, and participates in prenatal diagnosis and counseling. This activity has been planned and implemented in accordance with the Essential Areas and Policies of the Accreditation Council for Continuing Medical Education through the joint providership of the Christian Medical & Dental Associations (CMDA) and Soli Deo Gloria, MFM. Christian Medical & Dental Associations is accredited by the Accreditation Council for Continuing Medical Education to provide continuing medical education for physicians. The Christian Medical & Dental Associations designates this educational activity for a maximum of 22 AMA PRA Category 1 Credits(s)™. Physicians should only claim credit commensurate with the extent of their participation in the activity. To disclose that there was no relevant or financial relationships. The CMDA CE Review Committee of John Pierce, MD, Chair; Jeff Amstutz, DDS; Lindsey Clarke, MD; Mike Chupp, MD; Stan Cobb, DDS; Gary Goforth, MD; Elizabeth Heredia, MD; Curtis High, DDS; Bruce MacFadyen, MD; Dale Michels, MD; Shawn Morehead, MD; Michael O’Callaghan, DDS; David Stevens, MD; and Richard Voet, MD do not have any relevant financial relationships with any commercial interests. Description: The legal aspects of providing limited ultrasound are discussed and the low risk for liability for providing limited ultrasound explained in detail. The strict guidelines for the performance of the limited ultrasound per American Institute in Ultrasound (AIUM), American College of Obstetricians and Gynecologists (ACOG), and AWWHON are stressed. D. Discuss why only trained medical personnel should interpret limited ultrasounds in obstetrics. Description: The medical indications for limited obstetric ultrasound are discussed and training guidelines for performance of limited obstetric ultrasound are outlined. Various equipment choices are described including choice of transducers for performance of obstetric ultrasound. Completion of the posttest with a 70% passing grade is required to move to the next module. C. Examine guidelines for training in limited obstetric ultrasound. D. Distinguish ultrasound transducers and their uses. Description: Incidence of various fetal malformations is given along with the performance of a thorough anatomic survey. The diagnostic obstetric ultrasound with complete and thorough anatomic survey is contrasted to the limited obstetric ultrasound. The physics of ultrasound are discussed in detail. Completion of the posttest with a 70% passing grade is required to move to the next module. Description: Biometry of the first and second trimester ultrasound are described and demonstrated with representative images. Normal anatomy is described and visualized in actual ultrasound images. Completion of the posttest with a 70% passing grade is required to move to the next module. 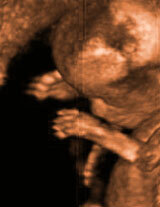 Description: Targeted ultrasound images are contrasted with normal ultrasound images. Emphasis is placed on performance of limited ultrasound in distinction to targeted obstetric ultrasound. Ultrasound risk assessment for fetal aneuploidy is introduced and basic Doppler ultrasound described. Completion of the posttest with a 70% passing grade is required to move to the next module. Description: Use of still images with actual measuring of biometry to emulate the skill necessary for the performance of biometry for CRL, BPD, AC, and FL. Students will be required to perform at least 250 correct image measurements (50-CRL, 50-BPD, 50 HC, 50-AC, 50-FL) and correctly measure the biometry of the fetus for this final portion of the course. NOTE: At the end of each module a short quiz of ten multiple choice questions is given. The learner must get seven of these questions correct before he/she is allowed to go to the next module. It is strongly recommended that nurses attend the three-day course  Institute in Obstetric Ultrasound Course  before they take the online course. The online course is NOT a substitute for basic training. It is an advanced course designed to provide additional education to nurses who are providing limited ultrasound at a Pregnancy Resource Medical Clinic. For additional assistance with this course, please contact Dr. Byron Calhoun directly at calhounbc@earthlink.net or at 304-388-1599 (office), 304-388-2915 (fax). NIFLA is licensed by the California Board of Nursing to provide Contact Hours for nurses. Nurses taking this course can receive up to 26.4 Contact Hours from California. While the course is officially approved only for the state of California for nursing credits, most states recognize such California credits. When you have completed the course NIFLA will send to you a certificate of completion that lists the number of Contact Hours you have received and NIFLA's California provider number issued by the Board of Nursing. When you report these units to your state board you should list the name of the course and NIFLA's California provider number on the forms you are to complete for your state. The cost of the course is $775 for medical personnel who are not associated with a pregnancy center that is a member of NIFLA, and $725 for those who are associated with NIFLA. To enroll, please choose either the Member or Non-Member selection below and click "enroll now". Please note that the Ultrasound Measurement Performance module in this course requires the Macromedia Flash plugin software, which is available for free by clicking here. Other linked documents may require the Adobe Acrobat Reader software, which is available for free by clicking here. Copyright © 2019 by Soli Deo Gloria MFM, LLC. All rights reserved. No part of this course may be reproduced in any form, by photostate, microfilm, xerography or any other means, or incorporated into any information retrieval system, electronic or mechanical, without the express written permission of Soli Deo Gloria MFM, LLC.